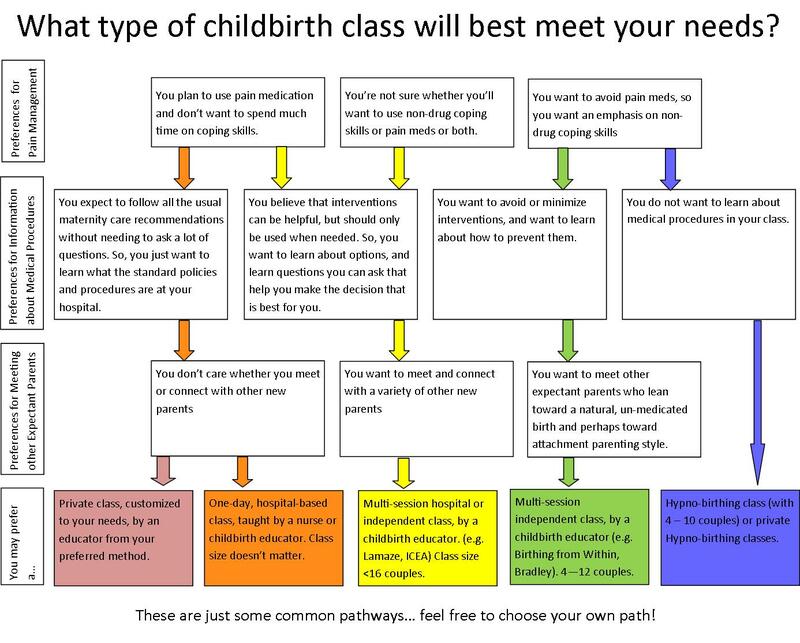 If you have multiple options to choose from for birth classes, here are some factors you could consider. You may be able to find many of the answers about classes on the instructor’s / organization’s web page, or by calling or emailing. I offer you several questions you might ask. You don’t need to worry about answering all of them, just ask about the things that matter most to you, depending on what kind of birth experience you are hoping for, and what kind of class would best prepare you for that. Where to take your classes: Hospital classes versus community classes. Private and online classes. Instructors: Finding out more about your instructor. Class Formats: How many sessions and how many hours? Logistical Questions: Timing, Location. Cost. Summary – What type of class is best for you? Hospital classes: Most hospitals with birth facilities offer childbirth preparation classes. You can usually find the information on their websites – it is sometimes filed under “community services” or “health education” and sometimes it is linked from the pages which talk about their labor and delivery services. Or your physician or midwife may give you information about these, or you can contact the hospital directly to find out more. Independent classes: Some childbirth educators may teach in their homes, in community centers, or other public places. To find their classes, look in local parent-oriented publications, or go to the websites of any organization listed in the “methods” article – they will link you to information about where to find classes in your area. Class options and scheduling In a big hospital, lots of classes are offered, in a variety of formats, so it’s easier to find one that fits your schedule. May be less flexible scheduling, as some instructors only teach a few series a year, or only teach on certain nights. Class size and fellow students Classes tend to be larger: 12 – 18 couples is common. Some hospitals offer large auditorium size classes with 100 students.Most of the students will be giving birth at that hospital. Classes tend to be smaller: 4 – 12 couples is common.Students may be planning births at multiple hospitals, birth centers, and/or at home. This provides a diverse peer group, which can lead to more discussion of options. Instructor Choice You may not be able to find out who your instructor will be and what her philosophy and experience is. You can learn about or speak to the instructor in advance, and ask about philosophy and experience. Philosophy May be biased toward medical model of birth, with a focus on preventing and treating possible complications. Class time may be more focused on medical procedures, without much time for practicing non-drug coping skills. (Breathing, relaxation, massage, etc.) May be more likely to view birth as natural and normal, and generally not in need of medical intervention. Class time may be more focused on non-drug coping techniques. Some independent educators have a strong bias against pain medications and medical interventions. hospital routines Knowledge of hospital specific policies and procedures: from little things like where to park, to bigger issues like routine interventions and pain medication options. Class may include a tour of the birth facility. More generalized knowledge of hospital procedures. May be more familiar with practices at other birthplaces, like birth centers and home birth. Instructor’s Role May be “provider oriented” with the role of informing you of what to expect, and what is “expected” of you, and not offering many alternatives. “Patient obedience classes.”Instructors may be not be allowed to teach about some childbirth options, and may not be able to say anything critical of hospital procedures. May be “consumer oriented”, encouraging you to take an active role in choosing the options you desire for your birth, and advocating for your choices.Instructors generally have more flexibility with class content and teaching methods. Can answer questions without constraints on what they’re allowed to say. Cost May be able to use insurance or medical coupons to pay. May not be able to use insurance or medical coupons, but may offer a sliding scale for low income families. Private classes. Many of the organizations and educators that offer group classes can also offer private one-on-one sessions. Some doulas can also offer these services. These typically take place in the client’s home, or sometimes in the instructor’s office. If the mom is on bed rest at home or in the hospital, the instructor can come to her. Advantage: Arranged to fit your schedule. Personalized to meet your needs. Disadvantages: No social interaction, or peer support from other people in a similar stage of life. Generally, little or no practice time. (“Class” tends to be only a few hours, and is mostly about imparting information and answering questions.) May be more expensive. Private classes are definitely the best option for people with unique needs, either complex situations that would not be addressed in class, or cases where it would be emotionally difficult to be in a group setting for class. Some examples are: women who have a history of sexual abuse who may need extra support when hearing information about the birth process; or parents who know their baby will not survive birth, yet who still want to learn about the birth process. Women who know they will be delivering by cesarean may not be well served by a typical labor and birth class and its emphasis on techniques for coping with labor pain and vaginal delivery– some places offer group classes for planned cesarean, but some just offer private instruction. Some families also choose private instruction because their schedule is too complex to fit in any regular class session. Online or DVD. Although there are some good programs, I do not think they’re adequate. We simply don’t pay as close of attention to them as we do to a live instructor, and may interrupt our sessions more or try to multi-task during them, so we don’t remember as much when we’re done. Without the chance to ask questions and discuss things, and the chance to practice skills and get feedback, we simply don’t learn as much about how the information applies to our unique situation, and how to adapt it to suit us. Plus, you miss out on the peer interaction with other parents. How experienced is she with labor and birth? Has she attended only hospital births, or also seen home births and birth center births? Has she given birth herself? What organization did she do educator training with? Lamaze? Bradley? ICEA? Is she certified? What types of teaching techniques does she use in class? Did she write the curriculum for the class, or is she teaching someone else’s curriculum? Childbirth preparation classes come in many forms, from one-day seminars (8 hours) to twelve week series (24 hours). When you register for a class, make sure you know how many sessions there are, and how long each session is. Also, be sure to check whether your childbirth class will include breastfeeding and newborn care info, or whether you’ll need to take additional classes to cover these topics. Often, when people discover that there are so many different schedule options, they’re not sure what the benefits would be of taking longer series, so they sign up for the shortest class possible, because that’s the cheapest and the easiest one to fit into their schedule. It’s helpful to understand what the trade-offs are for different formats. In general, even in a one-day seminar, the instructor will be able to convey to you all the information you really need to know to prepare for labor and birth. The differences are in the less tangible parts of the experience. Few chances to interact with classmates. You may get to know a few other people in class. You’ll have lots of chances to interact with others and build friendships. Very little time for questions. More time for questions and for discussion. Lots of discussions and personalized answers to your questions. Because of limited time, instructor may need to do a lot of lecture, which is the quickest way to convey information, but may not be able to spend time on other teaching methods that help students understand or retain the info. The more class time there is, the more the instructor can use teaching techniques which enhance understanding and memory of the material: videos, visual aids, demos, practice, homework, discussions, quizzes, Q&A, etc. Can be an overwhelming amount of information to absorb in a short time. You may only “get” a small portion of it and walk out on information overload. More time between classes to think things through, read more on topics of interest, practice skills, discuss things with your partner, find answers to questions that arise. Although the instructor may cover non-drug coping techniques, you may not have much practice time. More time to practice massage, relaxation techniques, breathing techniques, etc. Helps get it into your body – muscle memory – not just your head. Easier to fit into a busy schedule. More of a time commitment. Best for people planning a birth with pain medication, and people who are less concerned with possible interventions. Best for people planning a birth without pain medication or hoping to minimize possible interventions. For one day seminars: May be uncomfortable for a pregnant woman to sit for that many hours straight. For evening class series: May be hard for a pregnant woman to stay awake for an evening class each week. Weekend getaways: Another format that may be available to you is the weekend getaway to a Bed and Breakfast. These tend to have small class sizes, of 4 – 8 couples. Advantages: time to focus on the upcoming birth and baby without other distractions, romantic getaway with just the two of you. Disadvantages: May be much more expensive. Special populations. Some organizations offer classes aimed at particular groups, for example: non-english speaking students, teens, moms who are planning a VBAC, those expecting twins, women who will need a cesarean for a medical reason, Christian parents, etc. This can be helpful both for the specific information covered, but also for the chance to be a part of a group of people “like me”, who can offer valuable peer support. Click here for more information on what topics may be covered. Click here to learn more about childbirth preparation “methods” such as Hypnobirthing, Bradley, Lamaze, and Birthing from Within. When choosing a class, make sure the topics that are important to you will be covered, and choose the method which is closest to your own personal goals and philosophy. Ask the instructor (or the registrar) what teaching techniques the instructor uses (videos, discussions, role plays, etc. ), how much time is spent practicing skills, and whether there is time for questions and answers. The more interactive hands-on the class is, the more you will remember. One of the nicest things about a group class is the chance to get to know other expectant parents, share stories, commiserate over the challenges of pregnancy, get advice on what products to buy where, and so on. Ask the instructor what she does to foster community. Examples may include: long breaks with snacks, sharing rosters with group contact information, lots of time in the class for discussions and small group activities, encouraging parents to get together outside of class and so on. Ask if the class includes a reunion: some instructors have all their students come back for one session after the birth. This is a great opportunity to re-connect, share your stories, and ask questions about issues that have come up since the birth. When choosing a class, make sure you also think of logistical issues. You want to make sure you choose a class that is really workable for you and practical for you. Can you really make it work for your schedule? Sometimes when students call to sign up for a class, all the times that would be convenient for them to come are filled up, so they take something at a really inconvenient time, thinking “I’ll make it work somehow”, but then end up having to drop out. If the schedule at your chosen location doesn’t work, try checking some other local organizations to see when they have openings. Where are the classes held? Is it possible to park nearby? Is it expensive to park nearby? What does the class cost? Typical costs in the Seattle area are: $180 – 220 for a childbirth series, plus $35-45 for breastfeeding class, plus $35-45 for newborn care. (Other cities may be much cheaper.) Medical coupons may cover class costs. Ask about scholarships and sliding scale.